Incident Location: 3202 S. Mason Ave. Narrative: At 4:53 pm, firefighters from stations 1, 2, 3, 7, 8, 9, 16 and 17 responded to a reported apartment fire. The first arriving company found heavy flames and smoke showing from two second floor units of a large three-story apartment building. Crews attacked the fire with handlines, ventilated the roof and searched the structure to confirm know one was trapped inside. There were no injuries to report and crews were also able to rescue a pet dog and cat from the blaze. The Red Cross was requested for relocation assistance for 6 adults and two children displaced in the fire. UPDATE: The cause of the fire appeared to be unattended cooking, resulting in an estimated $270,000 dollars to a total of six apartment units and their contents. At 9:25 p.m., firefighters from stations 1, 2, 4, 9, 11 and 16 responded to a reported house fire. The first arriving engine company found heavy flames and smoke showing from the second floor and roof of the approximately 1,568 square foot two-story house. Crews made an aggressive interior attack on the well established blaze, bringing the fire under control in about 30 minutes. Of particular focus, was preventing the fire from spreading to the house next door as the two structures were only separated by approximately three feet. A search of the structure revealed no one was trapped inside. UPDATE: Upon further investigation it appears that someone forced entry into the structure and started a fire in a second floor bedroom of the vacant and boarded up house. The fire caused an estimated $65,500 dollars damage. The incident was turned over to Tacoma Police Department for follow-up. In a swearing in ceremony this afternoon, family, friends and the Tacoma Fire Department welcomed 20 new firefighters to their ranks. 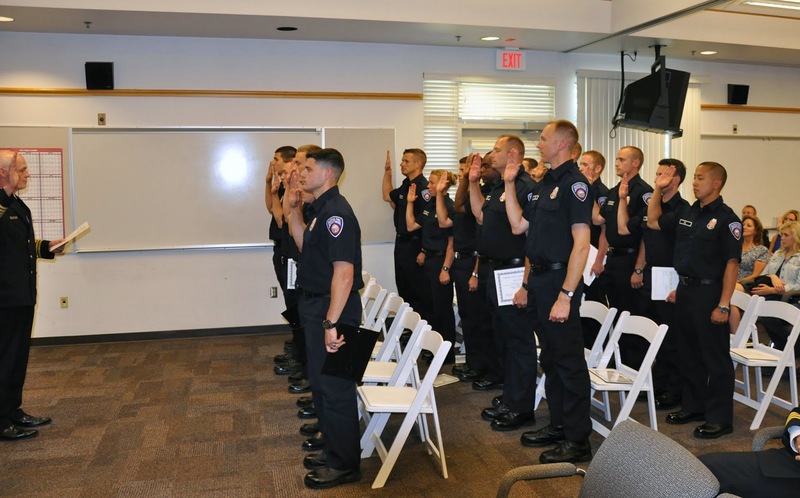 The graduates completed 13 weeks of intensive training, including fire suppression, emergency medical services, rescue and hazardous materials operations. Citizens can report fireworks violations through July 5 by calling (253) 798-4722. Tacoma Police will respond to fireworks related calls as units become available. If the fireworks violation appears to put people or property in immediate danger, call 9-1-1.